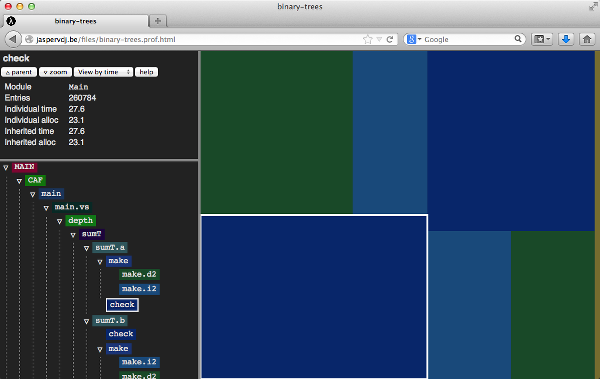 GHC comes with some amazing tools to do profiling of Haskell programs. In .prof files, you can see exactly in which function most time is spent and where most allocation is done. However, at Erudify, we have a huge amount of Haskell code – and at this point .prof files can become very unwieldy, and the text representation is harder to grok. This is why I coded profiteur, a simple HTML-based visualiser for GHC .prof files. Let us grab a sample program from the HaskellWiki. The code of this sample program can be found in the appendix. I saved this file as binary-trees.hs. Open the resulting file in your favorite (modern) browser and you are good to go! Here is the resulting HTML file so you can have a look without installing profiteur. As always, patches and pull requests are welcome on GitHub.